Synergy Metalworks has been named the 2016 winner of Uptown Marion’s Open 4 Business Competition, Uptown Marion announced today. 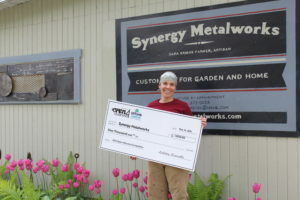 Synergy Metalworks will receive $1,000 from Uptown Marion and advance to the Sub-State Open 4 Business Competition next month. The Sub-State and Statewide Competition are hosted by Main Street Iowa and Iowa Economic Development Authority. Cara Briggs Farmer opened Synergy Metalworks in 2008 and has since worked out of her garage to produce fine art and craft, outdoor art and custom pieces for individuals and businesses in the Corridor. The Iowa native creates items ranging from 3D wall art to furniture pieces and decorative gates. Since metalworking became Cara’s full-time job, she has seen rapid growth in her business that has led to a need for a larger workspace. She plans to use the funds to help transform her newly purchased commercial property in Uptown Marion to use as both a workspace and a gallery/office in order to continue the growth of her business. “It was very impressive to see the thoughtful, progressive new business ideas coming to and present in Uptown Marion. The growth and expansion in the area is thoughtful and truly exponential. We, at Giving Tree, are excited and grateful to be part of such passionate, energized and growing Arts and Entertainment district!” stated Heather Akers, not-so-silent partner of Giving Tree Theater and a competition judge. Five companies, ranging from early-stage startups to businesses wanting to expand, presented their ideas to Akers and two other judges Friday morning. The other businesses included Eclipse Trading Post, Marketing & Communication Strategies, Kettel House Café & Bakery and Ali’s Weeds Floral & Gift Boutique. Uptown Marion will see that each of these businesses receive additional resources they need to help make their ideas a reality. Upton Marion Economic Restructuring Committee Members Scott Swenson, Regional Director of Small Business Development Center (SBDC), and Phil Hershner, Vice President of US Bank, also judged the competition. Sub-State Pitches will take place the week of June 13th in Cedar Falls, Charles City, Ottumwa, Osceola and Sac City. Winners at the Sub-State Open 4 Business Competition will receive $8,000 and move on to compete at the Statewide Competition on August 2nd in Mason City for a chance at an additional $20,000. Last year, Uptown Marion’s local winner, Giving Tree Theater came in second place at the Statewide Competition and won a total of $10,500 in competition prize money. Photo Caption: Cara Briggs Farmer, owner of Synergy Metalworks, accepting her prize from Uptown Marion on Tuesday, May 17, 2016. 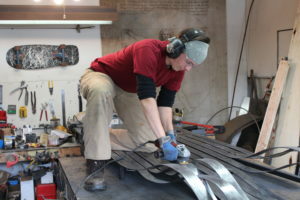 Photo Caption: Cara Briggs Farmer, owner of Synergy Metalworks, working inside her current, outgrown studio located at 933 9th St Marion, IA 52302.